Eyes: Free (17-10-’14) Click HERE for the online results from the Raad van Beheer. Click HERE for her showresults. Click HERE for a more detailed pedigree with pictures. 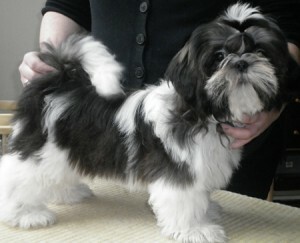 Armani From Audreys Paradis Ch. YPaparazzi from Audrey’sParadise Amer.Ch. Ch. TBlakysexy from Audrey’sParadise Int.,Lux.,Ned.Ch.